Joe: The Chicago Cubs not winning a World Series since 1908, nor making an appearance since 1945, is popularly excused by the myth of a curse. Did the Billy Sianis goat ejection in 1945 really cause the Cubs to not win, or was it the lack of quality play and management? Many argue the former. I do not believe it was caused by the curse. Brad: A lot of people are superstitious about sports, and maybe there is just too much negative energy at the field when the Cubs are playing. The vibe of the crowd affects how the players play, so if there is enough negativity floating around, the team is going to feel it. Ralphie: I don't think it was bad luck or a coincidence. I think their players just weren't good enough. Joe: The curse began in 1945, when Billy Sianis, the owner of the local Billy Goat Tavern, brought his billy goat to the game. Fans nearby Billy complained so much that the stadium officials had to ask Billy to leave and take his goat with him. This prompted Billy to proclaim, "The Cubs, they ain't gonna win no more." Brad: It's crazy what people can convince themselves to believe and even crazier what happens when a mass of people believe the same thing. Chris: I can only imagine how many other places around Chicago have been knowingly or unknowingly cursed by Billy Sianis, seeing as how there are not too many restaurants, retail stores, banks, doctors’ offices or troll bridges that are goat-friendly. Ralphie: It's a funny story, but it's not the reason they're not winning. There is no such thing as curses. Joe: Well, this makes for good storytelling and a good excuse for not successfully winning championships. Even efforts to bring a goat to key games by Billy Sianis' nephew have not broken the "curse." Chris: A blood sacrifice is usually the only way to erase a curse. So I don’t blame Steve Bartman one bit for fleeing town. I’m sure he has more than once pictured himself with an apple in his mouth, roasting on a spit on the pitcher’s mound at Wrigley Field. Joe: Steve Bartman, a lifelong Cubs fan, experienced tragedy in the form of inadvertently interfering with Moises Alou, the Cubs leftfielder, catching a foul ball. The umpire ruled interference, giving the batter new life. The Marlins overcame a 3-0 deficit to win 8-3 and tied the series at three games each. Then, the Marlins won Game 7. The Steve Bartman incident was the turning point of the series, and many believe without the incident, the Cubs would have won Game 6 and the series. Thus, making Sterve Bartman the "goat." Brad: Poor Steve Hartman, just trying to enjoy the game and catch the foul ball coming towards him. But it shows how much the crowds can rattle the concentration of the players. He is just the villain that everyone needs to blame for the Cubs losing the game. Ralphie: I think Steve Bartman was wrong to do what he did. I love collectors' items as much as anybody. In fact, just last week, I got to meet Dale Murphy, Joey Terdoslavich, Elliot Johnson, and Jose Constanza, and they autographed baseballs for me. It was a great day, but I would never interrupt a game to get a baseball. Joe: The Cubs should have made the 2003 World Series when they blew the Game 6 lead to the Marlins. Brad: They should only make it to the World Series if they get there the way any other team gets there. Ralphie: They should not have made the World Series in 2003. Their players just were not talented enough to beat the Marlins or any of the other teams. Chris: Sianis died in 1970, but now I’m starting to wonder if Sianis may have at some point uttered the words, “Hi-C, they ain’t gonna sell no more Ecto Cooler” or “Keebler, they ain’t gonna sell no more Magic Middles.” Does anyone know if Sianis’ goat ever craved Twinkies? Brad: The Cubs need a whole new name and a new field to completely shake the curse and their record. A new start might boost fans’ excitement, which would boost player morale. That will take them to the World Series. Joe: Rumors and discussions of the Cubs changing their logo are just more idle wishes of changing the "luck" of the Cubs. This, like the goat curse, will not change the outcome of the Cubs’ seasons. There are cases of businesses re-branding themselves to make a paradigm shift or new beginning, but I think that can and must be done without throwing out the Cubs’ history. Ralphie: I don't like it when teams change their logos. They should keep the logo they have always had and just work hard to recruit better players so they can change their record. Brad: I don't see why a new logo is such a big deal. Everything gets updated at some point. A new logo doesn't change the game. Joe: I believe the Cubs must develop a winning culture with the entire organization, including the fans and the community. This must be done with drafting quality players and people and building a winning team through their farm system. This long-term approach seems slow, but it will be a lot faster than waiting since 1945 for an appearance or 1908 since winning a World Series. Chris: The Cubs’ two sources of blame include one wanting to attend a game who was denied admission and is now welcome, along with one who was at a game who is now unwelcome. 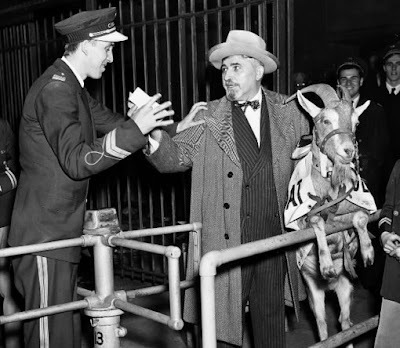 Is it considered ironic that goats are now welcome back, as opposed to Steve Bartman, who could only gain admission if he was dressed as a goat? Though I’m not sure if I would be more frightened to be sitting next to a live goat or a person dressed as a goat. Joe: The curse is just folklore, an excuse for the lack of quality play and management over a long period, reinforcing the myth of the curse. The Cubs will continue to lose until they change their mindset and attitude about winning. Ralphie: The Cubs are just going to have to get out there and recruit better players. Papa John's says, "Better ingredients. Better Pizza. Papa John's." The Cubs could just use that—“Better players. Better Team. Chicago Cubs."